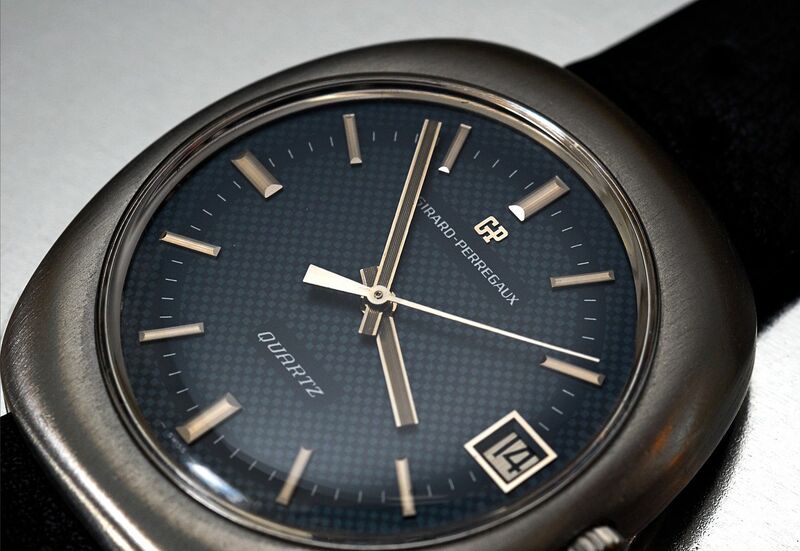 A while back I bought an early, non running, Girard Perragaux Quartz as a project. It seemed to want to go (always a good sign) but just stopped after a few seconds. My intention was to strip, clean and service the watch, hopefully learning more about quartz technology along the way. However I had quite a few other watch projects on the go at the time, so my watchmaker very kindly volunteered to see if he could get it going. We were both hoping that it might be a bit of crud in the mechanical parts of the movement that was impeding its progress. So it was stripped it down completely, all the moving parts given a thorough ultrasonic clean and then reassembled, checking the connections as it was rebuilt. The result? It was still stopping after a few seconds. Bugger! We feared it might have been the circuit that was faulty so I set about trying to source a replacement. Obviously parts for 40 year old, high end quartz movements are pretty thin on the ground (to say the least), but a friend stepped in and very kindly offered me a circuit, trimmer and quartz. 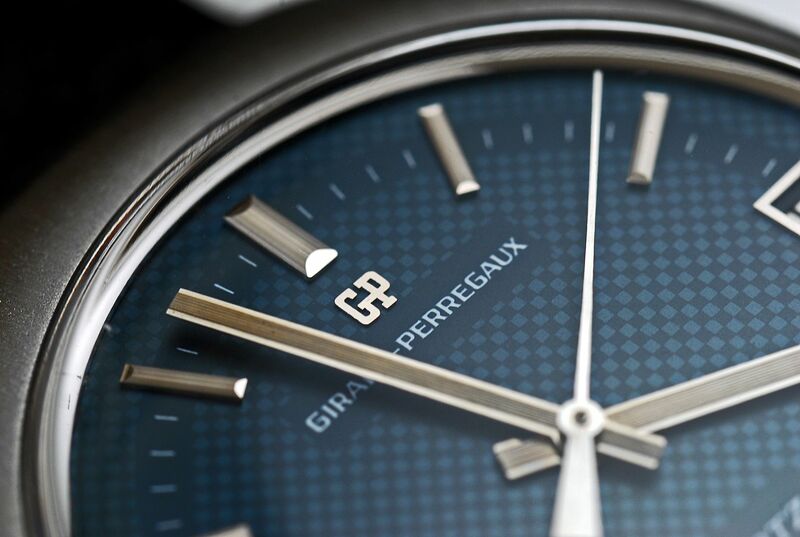 He's been working on another lovely Girard Perragaux with the same movement, so we've been keeping in touch. A little more investigation (okay quite a lot actually) revealed that the circuit was actually fine and it was an innocuous little screw in the drive train that had been overtightened, stopping the movement from running freely. It's amazing how something so small can cause so much work, lol! So, it took a while to fathom out but, we eventually got it running again - hoorah! 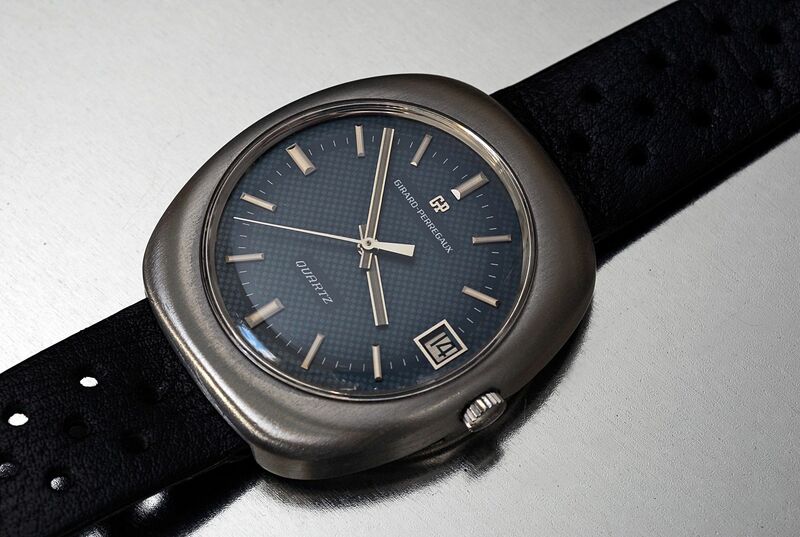 And the watch in question, a Girard Perregaux Quartz from 1972. 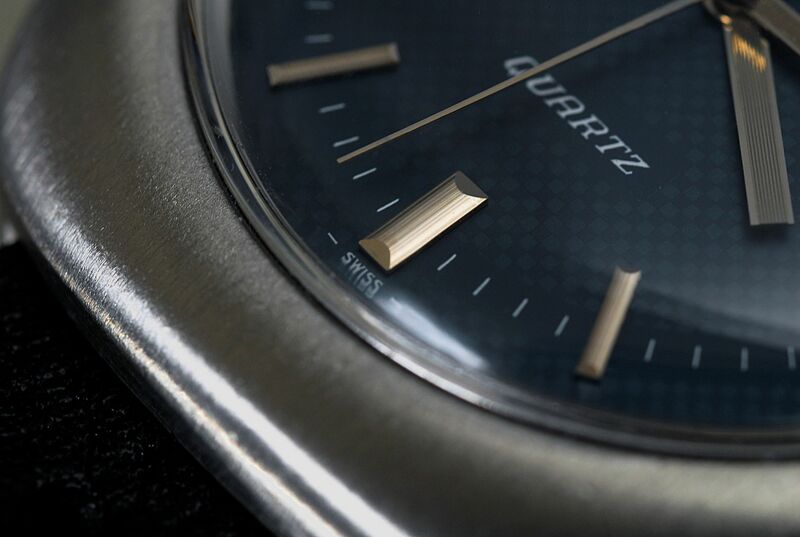 Horologically important for quite a few reasons, the main one being the calibre 352 was the first quartz movement to use a frequency of 32.768 Hz, which is now the industry standard. 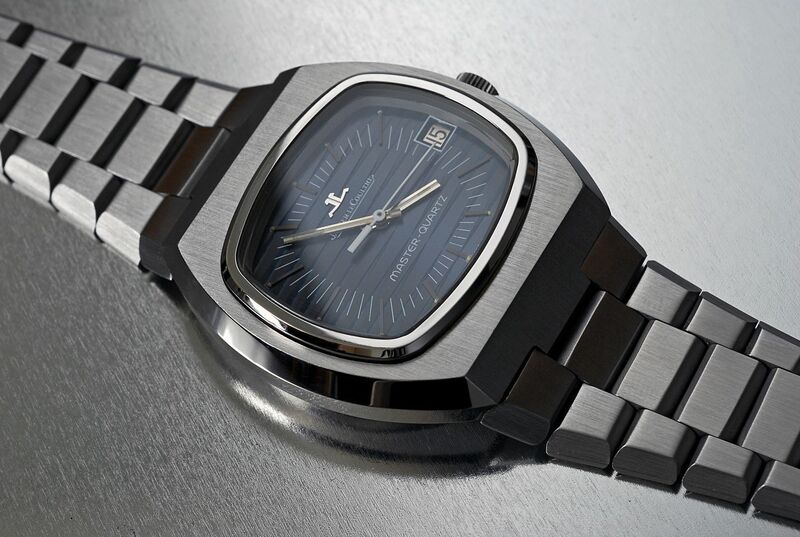 So this is the grandaddy of all practically all quartz movements. 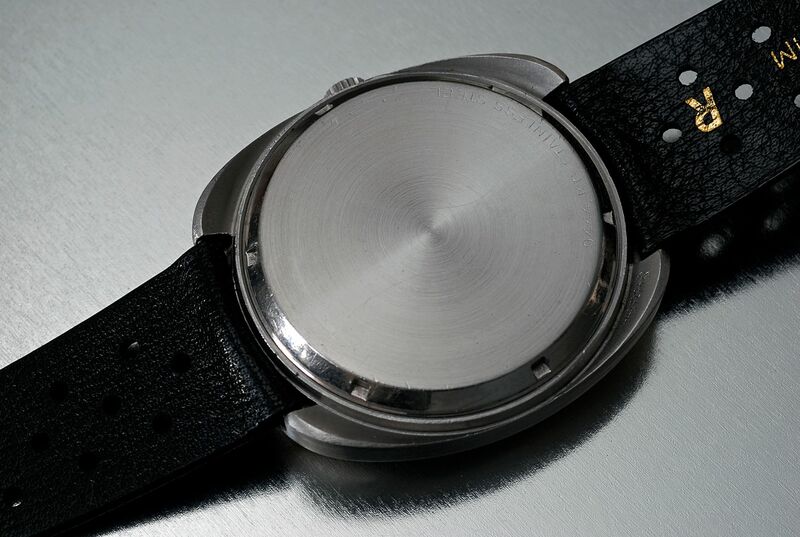 It also was the first Swiss movement to use a stepping motor. Anyway enough words, here's a few pics taken this afternoon. I particularly love the handset and dial on this example. 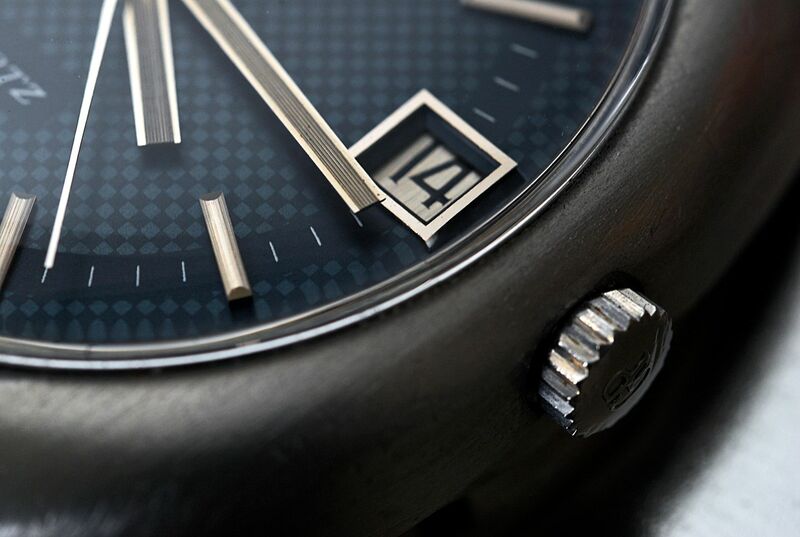 The carbon like printed dial adds a lot of visual interest and the handset and indices catch the light really well, with a great mixture of parallel lines and highly polished surfaces. The way the lines of the handset are echoed in the indices works very well, it's a subtle feature but once noticed you really appreciate it. Hopefully my pics capture it a little. Thanks for reading and if anyone want to know more about these great movements, have a look at the info filled thread below. Last edited by agent orange; 14-03-2013 at 23:09. Cheers Gary, always nice to see something brought back from the dead. Good work and an interesting watch. I found this period American press ad with the same case shape as my example. Interesting that GP were marketing it as "Rugged and carefree". 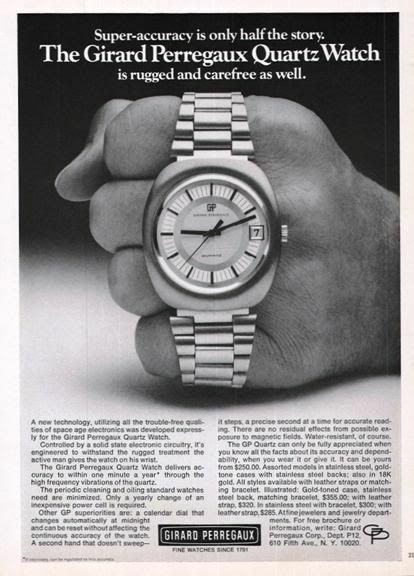 Also the price of $285 to purchase a steel on leather example, that was quite some money back in 1972. I'll start another thread with a little history and more pics a bit later. So when does Gazza's Watch Service Centre open mate? That's a very nice watch and to think it so openly advertises it's Quartz innards, how very non Swiss. this needs to be a tales from the bench no? Sorry mate only kidding with Gary didn't mean too undermine you. I can't take much credit for getting this GP up and running again, the vast majority of the work was done by Rocco. I thought it would be rather disingenuous for me to put this under a 'tales from the bench' banner. 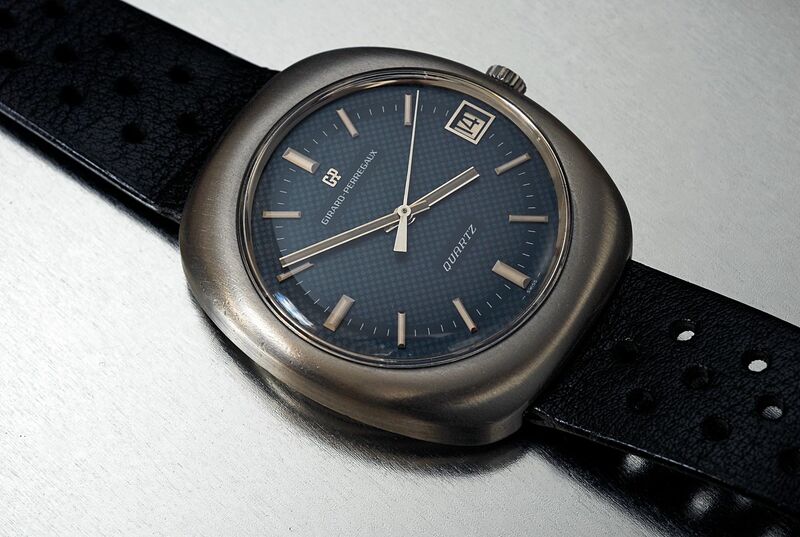 That JLC is a thing of beauty, clearly a product of the Seventies, but still with classic lines.